Improvement and maintenance of functional independence and physical performance. Promotion of fitness, health and wellness. Physiotherapists provide relief in a wide range of problems related to muscles, bones, joints, circulatory, respiratory and nervous system. They play an important role in managing the effects of congenital diseases, illness, chronic diseases, neurological conditions, trauma and the pressure and strains of everyday life. They are also skilled in providing care and physiotherapy related advice to the people with long term or terminal illnesses. The main objectives of the department include to provide the poor and the needy, the state of the art international standard physiotherapy services, to develop skilled professionals in the field of physiotherapy and to carry out evidence based practice, research and development in the field of physiotherapy and rehabilitation. 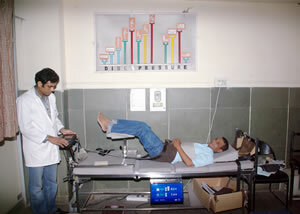 The OPD Division of Physiotherapy Department operates from 9:00AM to 5:30PM, five days a week from Monday to Friday. Electrotherapy Subunit I: It is equipped with various advanced and contemporary equipments like computerized electrotherapeutic modality which has the facility to give various types of low and medium frequency currents, Magnetic therapy unit (Magnetron). LASER, Ultraviolet therapy unit and vibrators of various shapes and sizes. Electrotherapy Subunit II: Equipped with electrotherapeutic modalities like continuous and pulsed Short-wave Diathermy (SWD), Ultrasound therapy, Interferential therapy (IFT). Transcutaneous electrical nerve stimulator (TENS), Vasotrain, the department is one of the best in Delhi. All these modalities are very helpful in management of acute and chronic painful conditions of muscles and joints and also pay a very important role in rehabilitation of patients with neurological and cardio-pulmonary disorders. Electrotherapeutic stimulator is used to stimulate the muscles and nerves in various types of injuries to nerves and for diagnostics purposes. Electrotherapy Traction Unit: This unit has facilities for static and intermittent cervical and lumbar traction. The unit is installed with 2 most advanced traction equipments. One of the equipment has the provision of applying Microwave Diathermy & the other one with the provision of Magnetic therapy in combination with traction (Combotherapy). Hydrotherapy Unit: This unit is equipped with Hydrocollator (moist heat therapy), Cryotherapy unit (cold therapy) and contrast bath. These modalities are used to alleviate pain, swelling, and stiffness and muscle spasm. Also, it has an advanced hydrotherapy unit called Hubbard’s Tank (Butterfly Bath) which is used for giving exercises in water to children and adults suffering from conditions like ankylosing spondylitis, rheumatoid arthritis, cerebral palsy, paraplegia etc. It has an inbuilt thernmostat to maintain the temperature of water within the therapeutic range. Wax Therapy Unit: Paraffin wax bath is used for giving superficial heat therapy to patients having pain and stiffness of peripheral joints like wrist, hand, ankle and knee. Exercise Therapy Unit: This unit is equipped with latest exercise equipments such as Kinetic communicator (kin-com), static cycle, quadriceps table, mini trampoline, free weights, dumbbells, therabands etc. for giving isometric, isotonic and isokinetic exercises to various joints. Apart from this manual therapy techniques such as soft tissue manipulation, joint mobilization/manipulation, muscle energy techniques, positional release techniques etc. are used for the treatment of patients. Extension Services: Time to time guidance is provided for establishment and smooth functioning of PT departments being operated at various CRCs and DDRCs. A senior physiotherapist is sharing the responsibilities of being a Nodal officer of District Rehabilitation Centre at Jaisalmer, Rajasthan. Manpower Development: For the development of skilled professionals in the field of physiotherapy, the institute is running a 4½ years duration Bachelor of Physiotherapy course in affiliation with the University of Delhi. The students are taught by dedicated and qualified faculty members with the help of the advanced audio-visual aids and specific emphasis is laid on the development of clinical skills of the students. After passing their fourth year examination the students are posted for internship of six months duration at various hospitals including the PT department of the institute on a rotational basis. One month rural posting is compulsory. During the academic year 2008 -2009 the students were posted at District Disability Rehabilitation Centres in Tonk & Jaisalmer, SVNIRTAR, Cuttak, Narayan Seva Sansthan, Udaipur for their rural training. One of the Demonstrators in the department has been sanctioned study leave for a period of 2 years to peruse her Masters programme in Physiotherapy (Neurology) from the CCS University, Meerut. Suraj Kumar Demonstrator Physiotherapist of the department attended the SPORTS MEDCON 2009, an international congress on sports medicine, underwent Advanced Team Physiotherapist course & presented paper titled “ Diagnosis and prognosis by physical strength and functional ability in patients with Low Back Pain”. Further he has 3 international peer reviewed publications as first author, 1 international peer reviewed publication as second author, 1 book review & 1 commentary to his credit apart from various presentations & deliberations in various conferences. Collaborative activities: The department arranged orientation programme in Physiotherapy for post-graduate diploma students of National Institute of Social Defence. Students and internees from Amarjyoti Institute of Physiotherapy and Indian Spinal Injuries Centre, New Delhi are regularly posted and given clinical training in the PT department. Postgraduate students from the Jamia Hamdard University were accorded permission for their clinical posting and to carry out their research for their thesis under the guidance of the internal faculty of the department.